Step out of the everyday and into adventure! Our beautifully appointed bed and breakfast suites reflect the traveler’s lifestyle that so many of our guests enjoy. We offer an adult-oriented lodging option that is both relaxing and smoke-free. 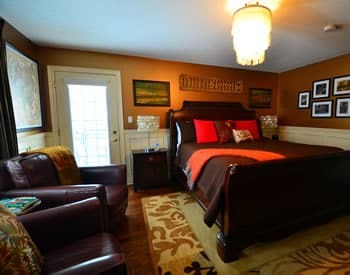 Our large, second-floor rooms feature king-size beds with Stearns and Foster pillow-top mattresses, sitting areas, hardwood floors, private balconies, gas fireplaces and private bathrooms with jetted tubs and separate showers. Room extras include fine bedding, flat-screen televisions with Blu-Ray players, Bluetooth clock radio, adjustable lighting, complimentary Wi-Fi, luxurious bath products and robes. An iron with ironing board and fan is included in each room for our guests’ convenience. Please note all suites are accessible via stairs to the second floor. B&B amenities include complimentary, wine passes, on-site parking and use of our backyard garden, gazebo and outdoor Jacuzzi hot tub. Relax with a glass of wine in our guest lounge area, enjoy complimentary snacks and beverages, and select a title from our extensive Blu-ray/DVD, CD and games library. A delicious breakfast is served at 9:00 a.m. each morning of your stay; please let us know of any special dietary needs at the time of your reservation.